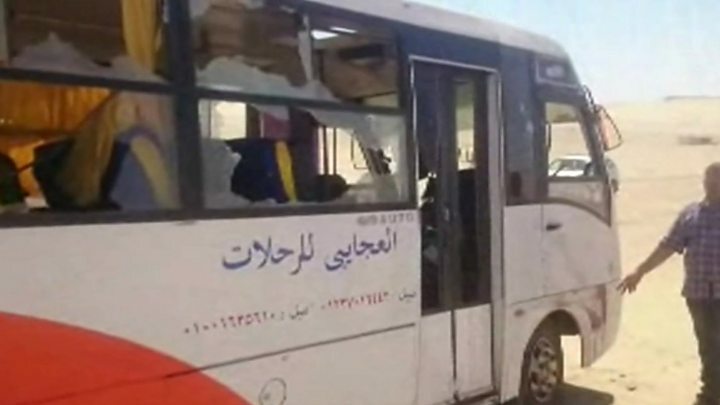 So-called Islamic State (IS) has claimed it was behind an attack on a bus carrying Coptic Christians in Egypt that killed at least 29 people and wounded about 25 others on Friday. Masked men boarded several vehicles carrying the Christians and opened fire at close range, witnesses said. The funerals of some of the victims were held on Friday night. 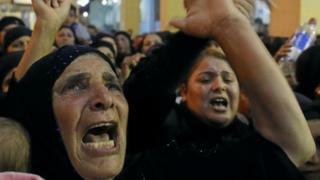 Egyptian aircraft struck "terrorist training camps" in neighbouring Libya in retaliation for the attack. President Abdul Fattah al-Sisi said six strikes hit the Libyan town of Derna. Announcing the strikes in a TV speech late on Friday, the president promised to "protect our people from the evil". He called for countries that support terrorism to be punished while appealing to US President Donald Trump for help. Military sources told Reuters news agency that the militants targeted in Libya were involved in the attack on Egyptian Christians earlier on Friday. In a statement, IS said the attack in the province of Minya was carried out by "a security detachment of soldiers of the caliphate", who had set up a checkpoint. It was in a small convoy that was stopped on a desert road near a police station on the border with Beni Suef province. The gunmen wore military uniforms and used automatic weapons before fleeing in 4X4 vehicles, eyewitnesses said. Children were among those who died. IS militants have targeted Copts several times in recent months. The militants killed a group of 21 Christians in a bomb attack on a church in Cairo in December 2016. Two suicide bombings this year at church services in the northern cities of Alexandria and Tanta on 9 April left 46 people dead. But IS has also built a presence in the country during the chaos.